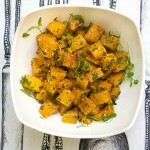 Simple delicious roasted butternut squash cubes with garlicky olive oil makes a perfect fall or winter side dish. Roast the Squash: Preheat oven to 400ºF. In a large bowl toss squash with 2 tablespoons olive oil, 1/2 teaspoon salt and several grinds of black pepper. Spread squash out evenly on a baking sheet. Roast for 20 minutes. Toss and roast for another 10 minutes or so, until squash is lightly browned in spots and cooked through. Make the Garlicky Olive Oil Topping: While the squash is roasting, heat 2 tablespoons olive oil in a small non-stick skillet, over medium-low heat. Sauté the garlic for a minute or two, until it’s soft and fragrant. Be careful not to let it brown. Put the cooked squash in a large bowl. Pour the sautéed garlic and oil over the squash. Sprinkle with parsley. Toss gently to combine. Season, to taste, with salt and pepper.